Avenue habitués first heard Rare’s “Hell yeahs,” which are delivered smoothly, a few days ago. Few knew he was trying out the new material. To replace his gymnast act, Rare has turned to comedy. He has recycled and street-performed many gags not heard since Henny Youngman. Yesterday, Rare made his new name official, he told me. There are many ways to fool around with hell yeah and Berkeley Reporter will be doing his share of the fooling. Hell yeah could be more popular than the Rare roar, which few students know, anyway. 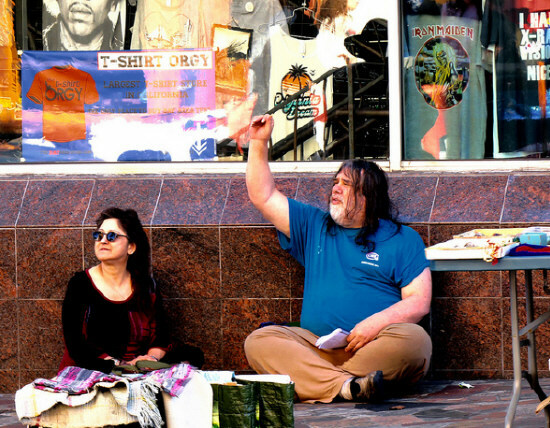 In a guide to street celebrities, like the Bubble Lady and Stoney Burke, the Daily Californian, to its everlasting shame, called Rare, Roar, a few years ago. Here’s the entire Rare routine—the call: “How do you like your meat? This entry was posted on Tuesday, July 12th, 2016 at 3:32 pm	and is filed under Telegraph Avenue. You can follow any responses to this entry through the RSS 2.0 feed. Responses are currently closed, but you can trackback from your own site.